Samyang has garnered praise for their modestly priced full frame 35mm primes and is now broadening its range with this new model. Designed for smaller sensors only this new high-speed 16mm model is the equivalent to a 24mm wide-angle in 35mm terms or, with the appropriate mount, as a 32mm equivalent on Micro Four Thirds cameras. Like other lenses in range, with the exception of the Nikon mount variant, this model has no mechanical or electronic contacts, meaning it has no automatic diaphragm and lacks compatibility with certain exposure modes and metering options. Regardless of the lack of automation the optical design is impressive. It has thirteen elements in total with one ED glass type and two aspherical elements to reduce numerous aberrations, and focuses to just 7.87” (20cm). This high-speed model has a large 77mm filter thread, measures 3.39 x 3.52″ (86 x 89.4mm) and weighs a hefty 1.28 lb (583g). 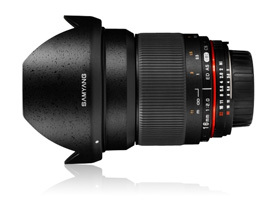 The Samyang 16mm f2 is available now at $399. 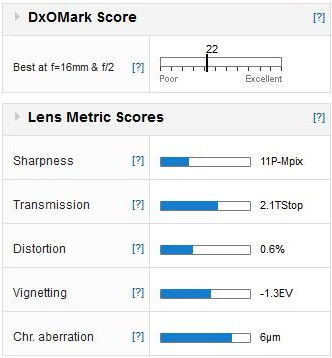 A DxOMark lens score of 22 points is excellent for short focal length lens like this. 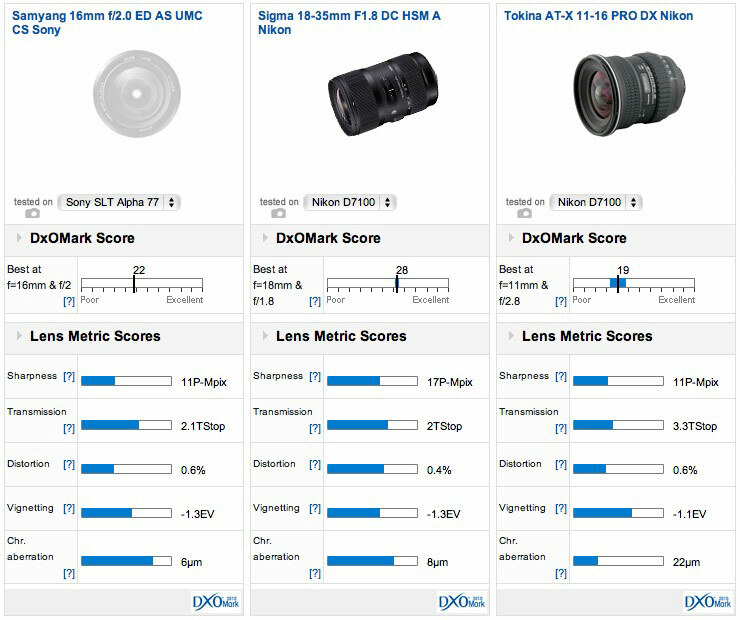 Peak sharpness is very good at 11P-Mpix but, like many high-speed lenses, open aperture performance is really only good rather than great on the Sony Alpha SLT A77. 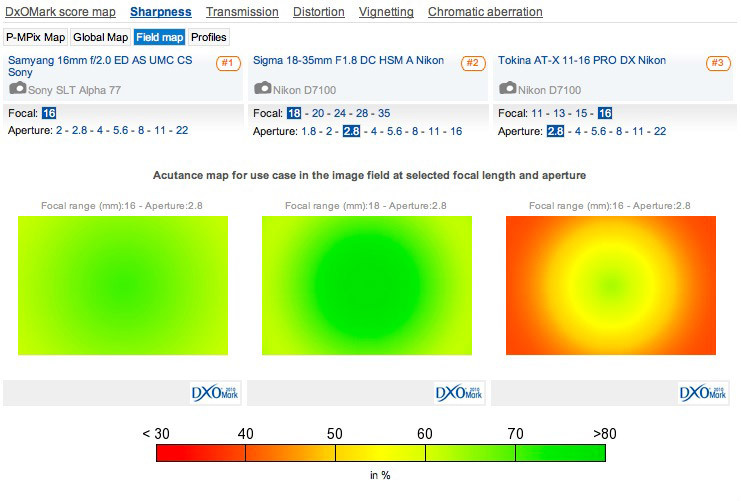 Optimal sharpness is achieved between f4-5.6 with gains made across the whole frame, not just the outer image field. Transmission is very good on the Sony, and distortion, vignetting and chromatic aberration are all reasonably well controlled, particularly the latter, which can be problematic on large-aperture wide-angle lenses like this. Previously we compared the Canon mount version of this lens with two prime models, this time though, as likely contenders, we’ve elected to compare the Samyang with two high-performance zooms on the Nikon D7100. As a 28mm equivalent at its widest, the new high-speed $799 Sigma 18-35mm f1.8 doesn’t quite have the field of view of the Samyang, however it’s very close in terms of lens speed. Unusually for a zoom, the Sigma is very sharp wide-open, at least in the center. The Samyang lags behind, noticeably, till f5.6, where it is on a par at that aperture and onwards. As for distortion the Sigma is practically identical at 18mm and can even better the Samyang with lower vignetting. Chromatic aberration is very well controlled on the Sigma at its widest, but it’s not quite as low as the Samyang in our tests. In real world use, it may be difficult to tell them apart. Against the much wider $659 17-24mm equivalent Tokina, the Samyang is more convincing. Although the Tokina is sharp in the center at the initial aperture it has poor border sharpness. The Tokina like so many zooms is a much better performer at the shorter end. Edge softness at 16mm continues throughout the aperture range, albeit progressively less so on stopping down. On the plus side the Tokina has lower vignetting and distortion at 16mm than the Samyang, but it exhibits much higher chromatic aberration than either the Samyang or Sigma. At f2.8 the Samyang still isn’t on a par with the less-wide Sigma, however sharpness in the outer field is far superior to the Tokina. While this model lacks certain features taken for granted these days such as full-aperture metering and automatic aperture control, not to mention autofocus and data transfer for flash control and the recording of EXIF data, the Samyang remains tempting for its balance of image performance and price.